Presenting the original motion picture score to the blockbuster 20th Century Fox feature film ALVIN AND THE CHIPMUNKS starring Jason Lee (MY NAME IS EARL, DOGMA) and those famous, adorable chipmunks Alvin, Simon and Theodore. 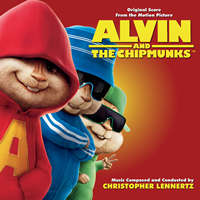 Composer Christopher Lennertz (MEET THE SPARTANS, SUPERNATURAL, SAINT SINNER) creates a heartwarming orchestral score that reflects all the rollicking fun and mischief of the Chipmunk’s first big screen adventure. Limited Edition of 1000 Units.